Update: First, Tuesday was my shopping day, so I didn’t have time to get the giveaway closed yesterday. So I’ll let the couple extra entries count. I will be contacting the winners. Congratulations! I am really happy with the results. I believe these tabbers will be going to people who really need and will use them. 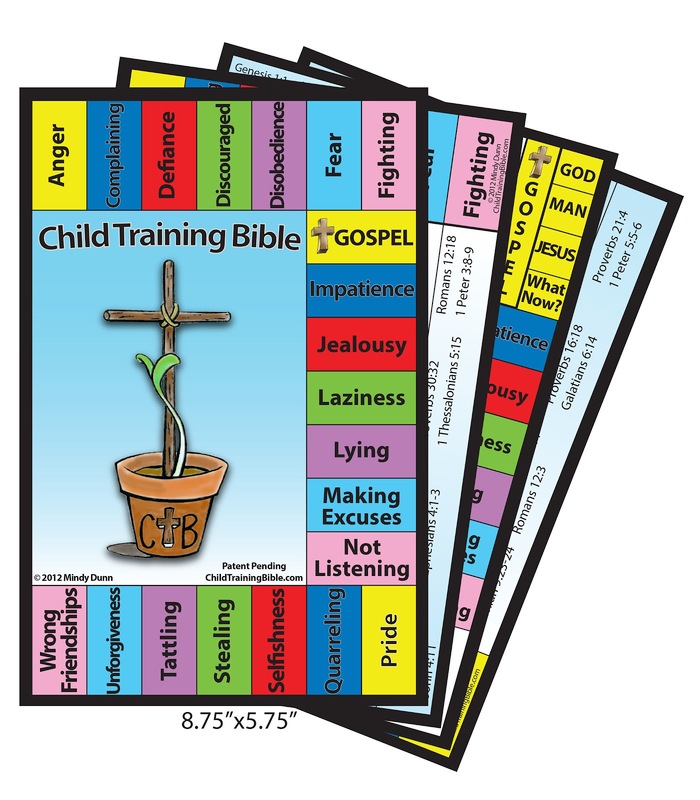 Remember, If you didn’t win, you can still purchase your own set of tabbers and make your own Bible at the Child Training Bible. 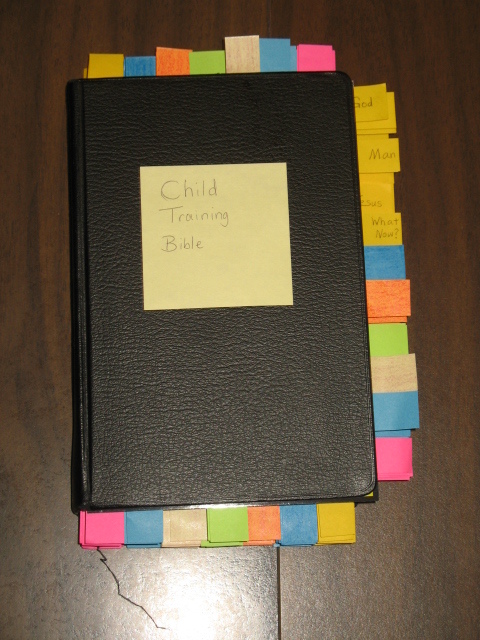 Have you heard about the Child Training Bible? I heard about it several months ago and was intrigued. I may have even participated in a giveaway for the kit. I decided it was something I would get… eventually. Then I saw a 2-for-1 special and bought it. But I didn’t have the budget for another Bible, and I didn’t have a blank one in my preferred translation (which happens to be KJV, by the way), so I filed it away. I also didn’t have the markers and tabs they recommend to go mark the Bible with. A few months later, my husband brought home a Bible from church. It had been left in the “Free Books” section, and was hardly marked at all–appeared brand new, in fact. There was no name, so the librarian had decided to give it away. It was a study Bible, full of commentary at the bottom of pages, but it was KJV–actually, an updated KJV, which changed a few words, like which to who, ship to boat, updated some of the really archaic words like astonied, etc. I decided it was perfect. Last Sabbath, I woke up feeling off. Not exactly sick, but I had a sore throat, and decided I would just stay home. I quickly decided it was the perfect opportunity to work on the Bible. I still didn’t have the markers or tabs, and there wasn’t money in the budget to get any, so I improvised. I picked out crayons to match the colors and marked with those, and I cut up some colored Post-it notes (coloring some to improvise colors I didn’t have), and used those to mark the pages. Sometime I plan on going back and changing to the proper tabs, but for now, I’m very happy with the results. It’s fully functional. I’m still debating whether to glue the master tab sheet on the cover as you can see in the picture, or just keep it inside the front cover as I have been keeping it for now. In case you’re not familiar with the Bible, here is how it works. There are a list of topics covering character issues, such as tattling, anger, lying, discouragement, etc. 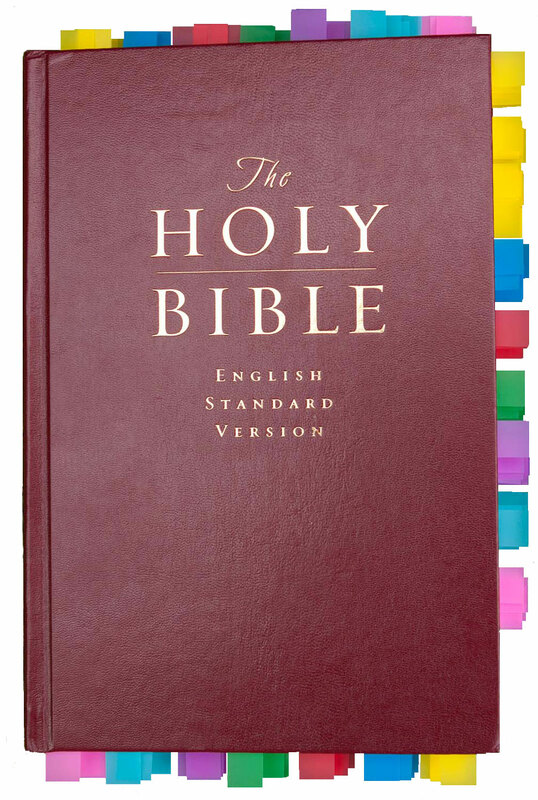 Each topic has a list of verses, and the topics are color coded. There are cards that go with each topic that also have heart questions and prayer suggestions on the back. What you do is go through and highlight the verses in colors that match the cards, then put matching colored tabs on the page to mark where it is. Then when you need to see what the Bible says about a particular character issue, you can open the Bible to one of the colored tabs and find the highlighted verse quickly. As I went through the verses, I realized that this Bible isn’t only going to be useful in child training. It spoke to my heart to. Many of the verses spoke to me. Verses about self control reminded me that I haven’t always been the best example of keeping my emotions controlled when dealing with exasperating children. Monday I took my first opportunity to use the Bible. I recently implemented the ticket system, and she had run out of tickets around 7:00 in the evening, not long before bedtime, so I told her to brush her teeth and go straight to bed. When I finished feeding the baby and came to see her, she was sitting on her bed, arms crossed, head down, lip slightly out, and darts of rebellion and defiance shooting out of her eyes. So I went and grabbed the Bible. I opened it and read a few verses on anger, defiance, and obedience, asking her to say short prayers based on what we had read. At first, it didn’t seem like the verses were having any kind of impact; I would ask her what I had read, and she would just grunt and look away, or hide her head under a pillow, or something like that. But with each prayer, she became less and less resistant, until finally her last prayer was heartfelt and unprompted, and she was all smiles. Of course, she still had to go to bed, but now her heart was in the right place, and she went cheerfully. But I’m not going to use the Bible just for discipline issues. As I went through it, I realized that we could use it for family worship. We could pick one verse or several on a topic that we felt needed to be addressed, read them, discuss them, illustrate them, and pray over them. There are 21 topics and an average of 8 verses per topic, so one verse a day would keep us busy for several months. I believe it will also be helpful for me when I find myself struggling with specific character issues (anger, discouragement, etc). And here’s the best part: Mindy from the Child Training Bible has agreed to help me with a giveaway. 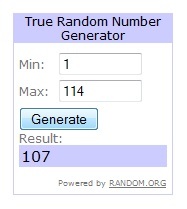 I have no real use for my extra set, except to share it, so I thought I would do that, and she agreed to send an extra set to whoever wins the giveaway. So we will be giving away 2 sets! As in, two winners! Like the CTB Facebook page. Blog about the giveaway with a link to this post, or share it with your Facebook friend’s or Twitter followers. Like my Facebook page or my Twitter Profile or subscribe to this blog. So that means you can enter up to four times. You can do both of any of the “or” options–blog and share on Facebook, for instance–but you only get credit for one of them. This giveaway ends 3/4/13–that is, Monday, March 4. I will count the comments, enter the number in a random number generator, and will generate two entries to be the two unique winners. I can’t wait to see who gets this wonderful resource! * Photos courtesy of The Child Training Bible. Used with permission. This Post is linked to Works for Me Wednesday and Modest Monday blog carnivals. I read your review. This looks like a wonderful resource! Liked Life of a Happy Mom on Fb. I liked the CTB page on Fb. I have an 11 year old son, as well as a 4 year old grandson …I need this Bible desperately! I need a way to show my little ones that they need to behave not just because I wannt them too, but because God does too! Thanks for this wonderful giveaway! I liked the CTB fb page, shared about the giveaway via FB, and liked your page:) Excited about this!! I liked your page on Facebook and I am following you on twitter. I read this post. Looks like a great parenting tool! This looks so interesting and very useful!